Mats for retail businesses can often serve more than one purpose, and this is certainly true for message mats. Not only can message mats help your business create a good first impression and serve as an effective marketing tool, but they’ll also capture dirt and moisture so that your business space remains clean and safe. When you use proper mats for retail businesses and commercial spaces, you’ll limit the wear and tear on flooring and be taking a proactive step to reduce the likelihood of slips and falls. Message mats can be used to deliver a variety of messages with specific themes, such as safety, quality, greeting, promotional, as well as industry specific mats. They’re produced using either the MasterWeave “sewn-in” process or by digitally printing the text onto the mat. Digitally printed mats are printed using a state-of-the-art digital printer in order to be able to create finer details. Message mats can be bilingual or English language only. Message mats can be effective tools for businesses in any industry, but they remain a top choice when it comes to selecting mats for retail business owners to enhance their retail space. Safety messages that support work place safety, such as when safety glasses are required or where to watch for forklift traffic. Quality messages that highlight company standards and remind employees to take pride in their work. Promotional messages that highlight your company brand and logo or call attention to a new product or service. Greeting messages that welcomes visitors into your space. Customized messages that support specific events, holidays, or industries, such as supermarket mats or message mats for the hospitality sector. The standard sizes for message mats are 3’x4’, 3’x5’, 3’x10’, 4’x6’, 5’x8’ & 6’x12′. 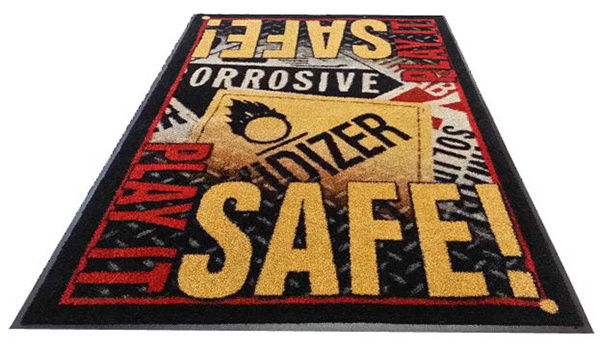 Welcome mats, safety mats, and other customized message mats offer the brilliant combination of eye-catching décor and functionality. These high quality mats are well suited for offices, hotels, and lobbies, and any retail space. Additionally, they are easy to clean and skid and slide proof, due to their 100% Nitrile rubber backing. City Clean can help you select the ideal message mats for your business. Mats for retail business owners may include message mats that thank customers for their business, while the right message mats for a warehouse may focus on safety. Regardless of your needs or your industry, the experts at City Clean will ensure you have the message mats you need to improve your business space. Contact City Clean today to learn more and get commercial mats for your business.